These have been busy days for 1860 München head coach Daniel Bierofka. The 39-year-old was the mastermind behind 1860 München’s promotion from the Regionalliga Bayern to Liga 3. Pictures of 1860 München’s promotion party went around the world. But while the club was celebrating Bierofka was right away busy adjusting the club to life in professional football. The head coach was always adamant that the success of promotion was only the first of many steps to get the club back to its former size. Furthermore, Daniel Bierofka pointed out on many occasions that the transition to the federal third division would be hard. That difficult transition was evident in the first few weeks of Liga 3 football. Defeat to Kaiserslautern, an emphatic win over SF Lotte, late disappointment in a 2-2 draw against Osnabrück and a 0-1 defeat to Uerdingen. Then a decisive 5-1 victory over SV Dornach in the Bavarian Toto-Pokal in Heimstetten just days before meeting Holstein Kiel in the first round of the DFB Pokal. It is a busy schedule at the moment. On top of that head coach Daniel Bierofka has been balancing life as a trainer of a Liga 3 side while taking courses in Hennef to complete coaching licence. Daniel Bierofka’s current licence only permitted him to coach clubs in the fourth division, but with 1860’s promotion to Liga 3, Bierofka has automatically been admitted the DFB’s famous coaching academy in Hennef. The head coach was the architect of 1860’s success in the Regionalliga Bayern last season (for more on this story subscribe to issue 15 of the Howler Magazine). The club fell all the way to the fourth division following the 2016/17 season. Relegated to Liga 3 investor and, part owner, Hasan Ismaik refused to free up the necessary funds that would have allowed the club to register for a third division licence. Instead, 1860 München were just days away from bankruptcy, and only a concerted effort by all shareholders helped save the club to fall even further down the table. Bierofka was then tasked to put together a side that could be competitive in the fourth division. Daniel Bierofka then formed a squad of the existing 1860 reserve side, which had finished in second in the Regionalliga Bayern that season, and veteran players like Sascha Mölders, Jan Mauersberger, Timo Gebhardt, Felix Weber and then, after the winter, Markus Ziereis, Bierofka managed the almost impossible by finishing first in the Regionalliga Bayern ahead of Bayern’s massively retooled reserve side. 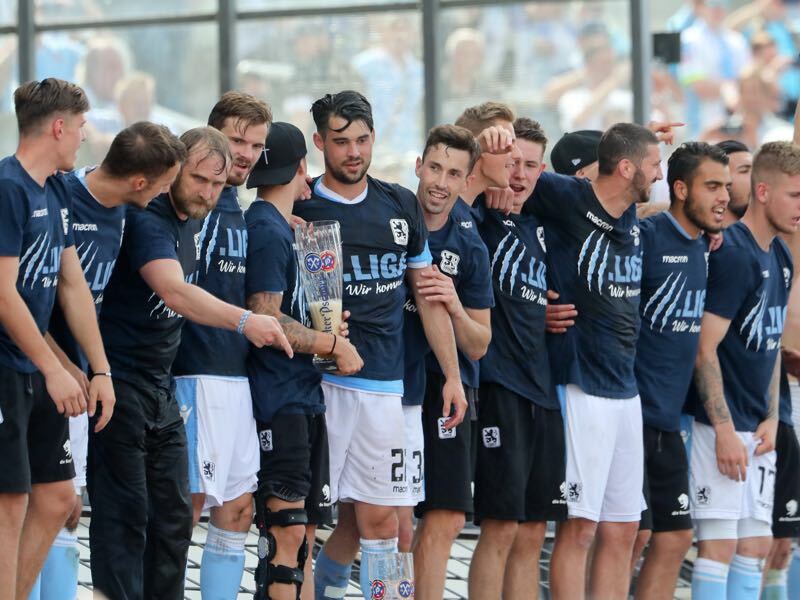 Then in the playoffs die Löwen eliminated 1.FC Saarbrücken dramatic fashion to squeeze through the bottleneck that is the promotion to the third division. Promotion to Liga 3 also means a return to professional football. After a year in the Bavarian wilderness, where 1860 had to play against mostly amateur sides, and the reserve clubs of Augsburg, Fürth, Nürnberg and Bayern Liga 3 is almost like salvation – especially as this might be the most attractive third division of all time. For the first time there will be no reserve sides in Germany’s third division. Furthermore, with the likes of Kaiserslautern, Uerdingen, Rostock, Cottbus, Braunschweig, to name a few, the league offers attractive opponents. Also, 1860 will be playing a real league derby this year when they face Unterhaching, in what will be a matchup that overshadows the reserve derbies from last season. Added to all of this is, the fact, that the city of Munich has changed its attitude towards 1860 München’s home ground. Following relegation to the Regionalliga Bayern 1860 München quickly moved out of the Allianz Arena and returned home to its old stomping grounds in Giesing to play at the Grünwalder Stadion. The stadium, much like 1860, however, was in dire need of repairs. Once a bastion of Munich football the stadium could hold 32,000 spectators and in 1948 even saw a capacity crowd of 58,200 in a match between 1860 and Nürnberg. 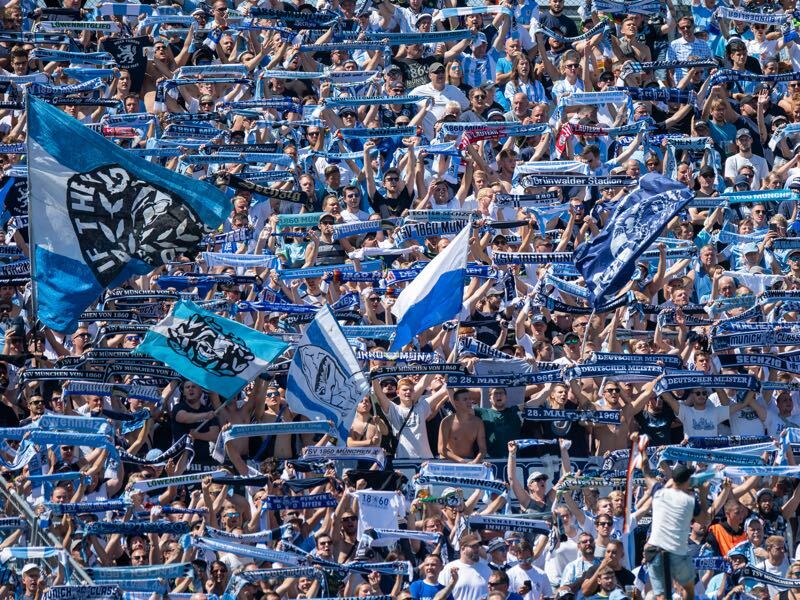 That capacity, however, had been reduced to 12,500 and large parts of the Westkurve, the home of 1860 supporters, had to be left empty as the stand failed to meet the high-security standards set by the city of Munich. That half-empty stand was a major discussion point throughout the 2017/18 season, as was the future of the stadium in general. Fans of the club, however, made it clear they wanted to stay. The city, and many residents of Giesing, however, were not so sure or even wholly opposed. They believed that football in downtown core would not be possible due to security standards and that fans would generate to much noise as well as create damage in the neighbourhood. The fans, however, were adamant to make it work. Self-policing and a call by fan groups ensured that Giesing remained clean on matchdays. Furthermore, there were only a few reports of violence and Giesing, in fact, saw a real upturn as the fans congregated in bars and restaurants around the stadium revitalising what was once the working quarters of Munich. Nowadays Giesing is cool once again thanks in no small part to die Löwen. Hence, with elections coming up in Munich the local government has completely changed its tune. The stadium was partly renovated and now fits 15,000 spectators. Furthermore, call have been made for studies to investigate whether the stadium could be further expanded to allow 1860 to stay in Giesing should the club be promoted to the Bundesliga 2 or even Bundesliga 1. For now, the Grünwalder Stadion is a sight to behold. But Bundesliga football still is some ways off. First comes the reality of Liga 3 football. By mid-August 1860 had collected four points out of its first four games. While die Löwen were fantastic to watch in all four games, it quickly became clear that there is a significant difference between fourth and third division football. Although Daniel Bierofka was able to add the likes of Preußen’s top scorer Adriano Grimaldi, Bochum’s defender Simon Lorenz and winger Stefan Lex to the squad the reality is that 1860 will have some learning to do in the new division. While the club heavily relied on fitness in the fourth division, banking on overpowering teams that were training only half as much because of their amateur status, that approach will not work in Liga 3 where all clubs are professional. The next step is to establish the club in Liga 3 and the long-term return the club to the Bundesliga. But for now, it is a growing process for the club and head coach Daniel Bierofka. “We are a step further”, Bierofka said after the 1-0 defeat to Uerdingen on matchday 4. As suggested above it was a match die Löwen dominated. But instead of seeing out the game in dying minutes it was Uerdingen that scored late. “If you can’t score then you have to be clever enough not to concede towards the end”, Bierofka quickly added. It is perhaps not the dream start to the new season. But ahead of the DFB Pokal match against Kiel (the Futbolgrad Network will preview that game), there is also a sense of calm around the club. The expectations have become more grounded in recent years. For now, it almost appears that the fans are happy to see their club play in Liga 3, at home in the Grünwalder against other historic clubs. But 1860 are a sleeping giant, and medium-term success will be necessary to keep the euphoria alive on Giesing’s heights.